Melt the good quality chocolate, but remember it MUST NOT be runny, so let is start to set before dipping the apricot in the chocolate otherwise the chocolate will not stick to the apricots. An alternative would be to ensure that the apricots come out of the fridge, thus cold. 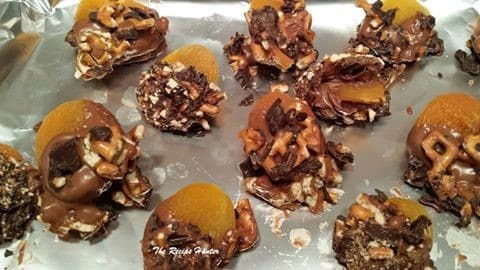 Once you have dipped the apricots in the chocolate, then immediately dip it into the pretzel mix and place it on a baking tray and once done leave in fridge to set and munch away!!! Note: If you do not have or cannot find Snappers (caramel, chocolate and pretzel treats) use any salty pretzels, and slice your favorite chewy caramel sweets into small pieces and add some chopped chocolate together in a bowl.